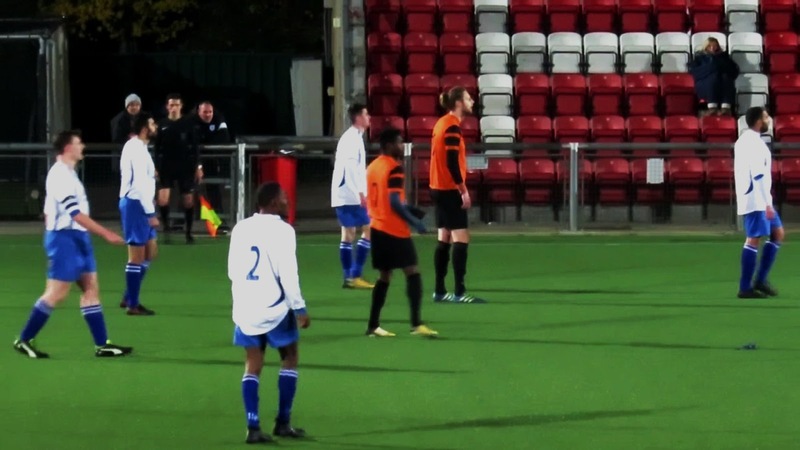 Enfield 1893 FC welcomed Tower Hamlets for an Essex Senior League tie on Monday night a little over 48 hours after an eventful FA Vase Second Round tie between the two sides at Mile End Stadium. That game ended with the home side on seven men and 1893 with ten men - Matthew Hanning's side had won 1-2 to earn a Third Round game at Hullbridge Sports. LUKE WITH HAD AN EVENTFUL NIGHT FOR TOWER HAMLETS SCORING TWO GOALS. HE WAS SENT OFF IN SATURDAY'S VASE GAME. Just after kick off the cry of 'Who's marking Andy Carroll?' came from the home side in relation to Tower Hamlet's centre forward Luke With who has a passing resemblance to the West Ham United player especially in height. Hamlet took an early lead via Lamar Earle on six minutes with O'Neal Rowe standing out for me showing some really good play with lots of pace going forward. 1893 equalised just prior to half time when James O'Brien rose to head home a looping free kick into the box. The second half had many talking points - Tower Hamlets re-took the lead when With scored from the penalty spot after Matt Duberry had handled in the box for Enfield. He was given a yellow card but did he stop a goal scoring opportunity? Could it have been a straight red? JOIN THE DEBATE - WAS IT A FOUL ON JOSH SYKES AND A PENALTY KICK? Sykes was involved again when he, the Enfield team and bench claimed he was fouled on the edge of the box only for the referee to wave play on for With to score his second goal and win the game for his side in injury time and gain some revenge for the Vase defeat on Saturday. Michael Cordery, Matt Duberry, Joe Clark (Ryan Cosson 68), Matthew Thoma, James O'Brien, Andrew Tirivanhu, Jacon Dixon (Joe Johnson 70), Joe Staunton, Josh Sykes, Daniel Jones (James Bricknall 46), Jayden Hocking-Rising. James Pellin, Lamar Earle (James Ross 90), Antonio Monteiro (Wale Odedoyin 74), Jerome Anthony, Alhousman Ndure, Tola Odedoyin, O'Neal Rowe, Mata Julio (Nathan Ackie 90), Luke With, Frankie Sinclair, Reece Capleton. Unused substitutes: Kayode Tobun, Charlie Casey. Never a penalty, i have seen blades of grass stand up better than him.